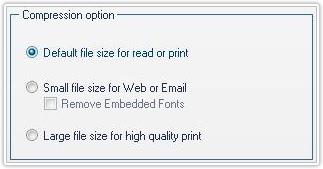 PDFCool Studio "Compress Document" fuction allows the user to adjust the size of selected PDF documents freely, so that the adjusted documents can be used for read, print, website or sending emails. Setting: Choose output path by click , or enter the output path directly by hand. b. Choose the small file size for Web or Email. 5. Click on the Compress button to finish the compressing process.